against the position that the Shroud was a painting. No artist ever painted such a complex depiction of the Crucified. It was a dreary, rainy afternoon, April 7, 1980. I should have had the light on in my study but I didn’t because I was in a melancholy mood. Then the phone rang. I recognized that baritone voice on the other end of the line and knew I was talking to Hershel Shanks, founder and editor of the world’s largest circulating biblical archaeology magazine, The Biblical Archaeology Review, calling from Washington, D.C. It is important here to insert here that Dr. Gambescia was not rejecting the work of the French physician, Dr. Pierre Barbet; he was actually building upon Barbet’s work. Neither was Dr. Gambescia rejecting the special interpretation of the arms and their attendant blood flows proposed by the late Mons. Giulio Ricci. His proposal, however, does suggest an interpretation different from that proposed for the blood flows for the feet than that offered by Mons. Giulio Ricci. It is this new interpretation that we are introducing for further research by the medical profession to be discussed alongside the earlier discussions for the feet. . . .
1. Artists down through the ages have presented the Crucified wearing a crown of thorns. The Shroud shows the Man of the Shroud with a “cap” of thorns. 2. Artists have always depicted the Man of the Shroud with no rope holding the torso against the stipes of the Cross. The Shroud appears to support the view that a rope pulled the torso back to hold it against the upright (stipes) of the cross. 3. 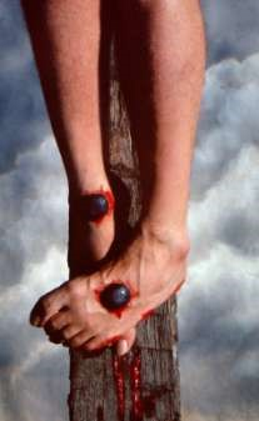 Artists have traditionally rendered the Crucified with nails through the palms of the hands. The Shroud shows them to be through the wrists. 4. Artists have long painted the Crucified showing the arms in a “Y” type of stance. But Mons. Giulio Ricci, who studied this in detail, shows that the right arm was likely bent at a right angle, whereas the left was in the “Y” position. 5. Artists have followed several different paths in rendering the feet. Sometimes they show the feet (especially in crucifixes) with the right foot up against the stipes of the cross, and the left nailed atop the right—all with one nail. At other times they have depicted the left against the stipes with the right atop the left foot—again, all with one nail. And sometimes the two feet are nailed side-by-side on a slanted platform (suppedaneum). This latter view is common in Eastern Byzantine, Greek, and Russian Orthodox crucifixes. Gambescia’s view would require two nails, one going through front of the ankle of the right foot to anchor it directly to the stipes, with the left foot nailed atop the center of the right using a single nail leaving the left foot free to swivel. This list, then, and the complexity it represents, itself becomes a powerful argument against the position that the Shroud was a painting. No artist ever painted such a complex depiction of the Crucified. Yet, students of the history of art—interested especially in cladistics—can now actually see the Shroud as the beginning of a “tree of descent” where one can study just how the many painted views of the Crucified diverged over the centuries, influenced by various translations of the New Testament in conjunction with markings on the Shroud itself and the heavy pressure of tradition in numerous different geographical locales. But that would be the subject of another paper. With regard to other images on the Shroud, few of us can see them. "I think I can see" is not a substitute for an observation, and observations must be confirmed. When Fr. Francis Filas (deceased) claimed he saw the coins, lituus and all, he was looking at specific photographic prints. He had many prints produced at increasing contrast. Finally, all that was left was strings of dots. It took a numismatist who was familiar with ancient Roman coins weeks to "see" the lituus in those photographs. Your mind tries to make sense out of any "patterns" your eye can see. Psychologists have a lot of effort invested in studying such phenomena… It is dangerous to build a scientific theory on such shaky foundations. Your mind tends to see what it expects and/or wants to see. (Rogers’ review, p. 15, available at: http://www.shroud.com/pdfs/rogers.pdf). The ever present danger of pareidolia and other related issues covered in this extensive endnote (including such problems associated with photo-lithography in the publication process; photo flipflopping [see 13.a below]; cropping, [see 13.a below] etc.) promoted my extreme caution when I asked of Dr. Adler this special favor to examine the Shroud in person in June 1997 to verify whether or not the markings that had been digitally enhanced were there and could be seen without digital enhancement. This footnote, then, not only covers pareidolia, but also other problems that are not technically defined as pareidolia.